Can’t-Wait Willow is a truly adorable little book. I found myself reading it as if I were reading it to a small child and really enjoyed it! If you haven’t guessed, Willow has a little issue with waiting. 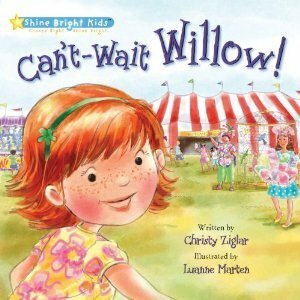 In her little adventure Willow learns the importance of waiting through a colorful journey to the Over The Top Circus. Can’t-Wait Willow is an adorable little book that your kids will truly love as they learn the importance of not always getting what you want… It was also a nice little reminder for me! The book is full of really pretty illustrations that will keep your little ones eyes busy as you read to them yet is written simple enough that they can learn to read it on their own and still enjoy it. Can’t-Wait Willow is the first book in a new series designed to help re-enforce those little lessons we all strive to teach our little ones as well as help them in developing their reading skills. It is published by Shine Bright Kids and more information can be found below. The Shine Bright Kids series provides children and their families with a relevant framework to help instill solid values and teach the importance of making good choices. The principles that will be explored include: using good judgment, taking responsibility, having a positive attitude, and demonstrating perseverance. About the Illustrator: Thanks to her first grade teacher, who recognized her superior skills in drawing a robin, Luanne Marten has been drawing, painting and sketching ever since. She is a great experimenter and has a fresh, whimsical approach to bring her characters to life. Website: The author’s website has great resources to support the book, including a printable poster with ‘Ways to Shine Bright,’ as well as reward chart you can use at home with your children. Pictures of you and your family enjoying Can’t-Wait Willow! are encouraged on Facebook and Twitter!